Anangu Pitjantjatjara Yankunytjatjara (APY) is incorporated by the 1981 Anangu Pitjantjatjara Yankunytjatjara Land Rights Act whereby the SA Parliament gave Aboriginal people title to more than 103,000 square kilometres of arid land in the far northwest of South Australia. 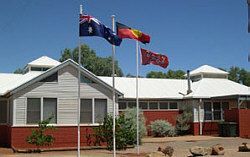 All Pitjantjatjara, Yankunytjatjara and Ngaanyatjarra people who are traditional owners of any part of the Lands are members of Anangu Pitjantjatjara Yankunytjatjara. The main communities on the Lands include: Indulkana, Mimili, Kaltjiti, Pukatja, Amata, Pipalyatjara, and Watarru. There are several homelands as well, the larger ones being Kalka, Kanpi, Nyapari and Yunyarinyi . The APY administration centre of the Lands is located at Umuwa. Anangu Pitjantjatjara Yankunytjatjara is seeking to improve its provision of electronic services and sees the internet as a vehicle to help reduce the isolation of the communities. APY oversees the activities of the various constituent groups serving the needs of the people on the Lands. It also helps shape policies regarding economic and social development. The members of APY meet at least once in every calendar year. At its meetings, every effort is made to reach a consensus. If consensus cannot be reached, then the adult members present may decide to resolve the question by a vote. Under the APY Land Rights Act, the Executive Board is the governing body of APY. Its 14 elected members from across the APY Lands are elected for a 3 year term under an election supervised by the Electoral Commission of South Australia. The Executive Board chooses its own Chairperson. The APY Chairperson is Mr Frank Young. The APY Executive Board must meet at least every two months, though it often meets monthly because of the number of issues they consider.